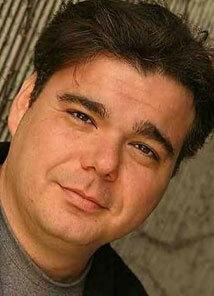 Brian Scolaro is an actor, writer, and stand-up comedian. He has done stand up on his own half hour special Comedy Central Presents: Brian Scolaro as well on The Late Late Show with Craig Ferguson, Late Night with Conan O'Brien, Comedy Central's Live at Gotham, and ABC's Comics Unleashed. He is most known for being Doug on TBS's new hit series Sullivan and Son, Stuart on FOX's Stacked, and Gordon on NBC's Three Sisters. He has also acted on Showtime's Dexter, AMC's Mad Men, ABC's Grey's Anatomy, NBC's Harry's Law, TNT's Men of a Certain Age, Disney's Wizards of Waverly Place, Bob Odenkirk's film The Brothers Solomon, numerous appearances on HBO's The Life and Times of Tim, as well as many other programs and films. Brian Scolaro thinks whores stole Halloween from the kids at the Laugh Factory in Hollywood, CA. Need a separation b/t church & altered states. Brian Scolaro hates garbage trucks.